Relish the memory. : Marking Memories with Macarons. It seems that excessive sun, exceptional feasting and numerous other summer activities have kept my fingers from talking the talk. But it’s back to business for Relish the Memory and to mark it’s one-year anniversary we are celebrating with the infamous French confectionery – Macarons. Not just one, but a tower of them. Despite their very rich history these sweet-meringue delights have become increasingly popular in the later years. Two almond cookies squished together with a buttercream, jam or ganache filling. Sounds simple? Not quite. With an egg white, icing sugar, white sugar and ground almond batter these treats are a science of their own, and can take years to perfect. The Ultimate Wedding spread: Macarons, Baby Lamingtons, Lemon Tart, Jaffas, Pineapple Lumps & Carrot Cake. 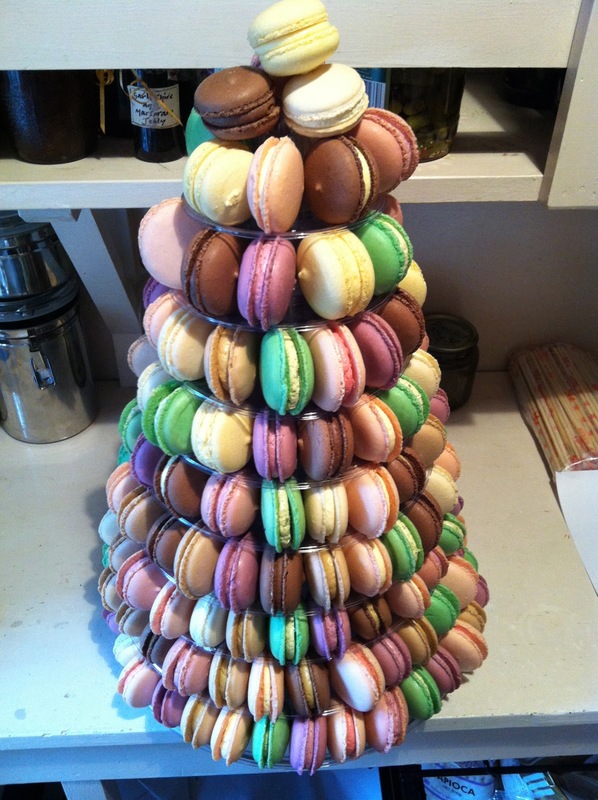 Alluring and dazzling to both the tongue and the eye, this tower of macarons were a sure highlight of my summer season and did a notable job of transforming a wedding into an exceptional and unforgettable occasion. 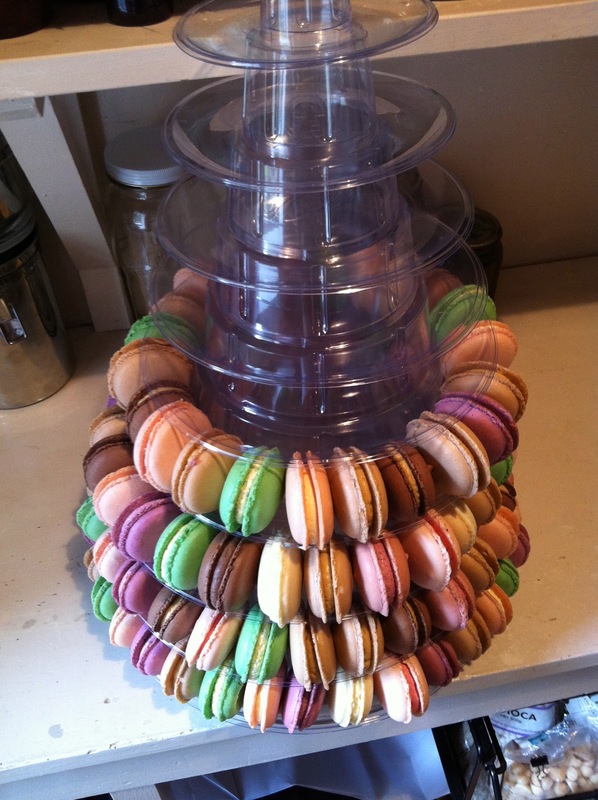 As extended family I offered my services and had the task of helping turn these delicate sugary shells into this mountain of elegance. With 13 different flavours in tow including Café Mocha, Pistachio, Lemon Curd, Vanilla Crème, Ripe Raspberry and Chocolate Cointreau to name a few. They were more than just a sweet treat – they were an experience. If you are a macaron virgin, this is basically how it goes….Your teeth dive into the fragile and crisp outer shell which then collapses onto the chewy-nutty interior, moistened and harmonised by the fragrant creamy/fruity/chocolately filling. The initial bite is sensational and as I found out the hard way stopping at just one is near impossible. Somehow in all of my awe I thought it a good idea to sample each one of these morsels. After making my way through the list of flavours, I quickly realised it was not one of my wisest moments. They were all so great – it was difficult to choose a favourite, but Pistachio and Vanilla were both standouts. My first attempt at the Macaron was a while ago now and from what I recall, it was an interesting one. After whipping up a batch of Annabel Langbein’s Lemon Curd I was inspired to attempt the lemon variety. But with no yellow food colouring, humid weather and amateur knowledge my pale green discs were rather sub-par. Since then I have been more than happy to leave these to the more experienced baker. Chocolate Macaron c/o Everyday Gourmet, Dunedin. Regardless of my Macaron faux pas and overdose I still strongly vouch for these delights and recommend that you give them a try. If your lucky enough to make it to the beautiful City of Paris then head to Laduree for the best in the business. Due to their popularity you will find these treats throughout NZ, and for the big city slickers I suggest heading to La Cigale Parnell Markets to taste their vibrantly coloured range. Peach is a winner. But the options are endless. However, I must warn you they are seriously sweet and unless a sugar hangover is on your agenda, then I recommend sticking to one, two or three at a stretch. One Macaron I wish I hadn't missed. Photo c/o Dunedin's finest.